What is the Research Starters feature in Discover? 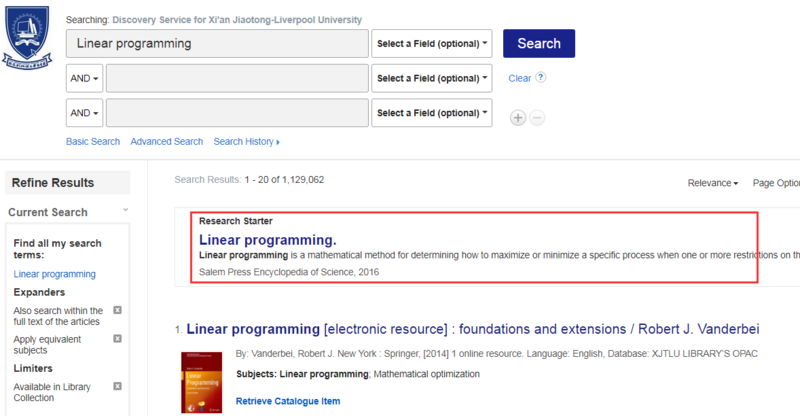 Research Starters is a feature in Discover that provides links to citable, authoritative summary articles for thousands of popular topics. Designed to assist users with their research, this feature was developed based on extensive studies with undergraduate and graduate students. When a user conducts a search in Discover, a Research Starter (outlined below in red) may appear at the top of the Result List. For those topics identified as most popular, Research Starters will retrieve relevant articles that link the user to related information and detailed bibliographies. This tutorial demonstrates the Research Starters feature on the Discover interface. If a Research Starter appears on the Result List, as in the example above, simply click the article title or the More button to read about the topic or find related articles and images. From the overview article page, you can read the HTML Full Text article, listen to the article using the Text-to-Speech feature, or add it to your personal folder. You can also click the icons under Tools to print the article, email it, save it to your computer, etc.